Hiding away in the heather on Bamford moor this now prostrate menhir would have in it's day been one of, if not the finest example of a standing stone in Derbyshire. Over 2 metres high the deep weathered grooves it sports are a testament to it's great age. Said to have been leveled early in the 1900's by the landowner to stop walkers using it as a landmark this stone is one of the saddest examples of vandalism i've ever witnessed and would be an excellent re-erection project for the powers that be. 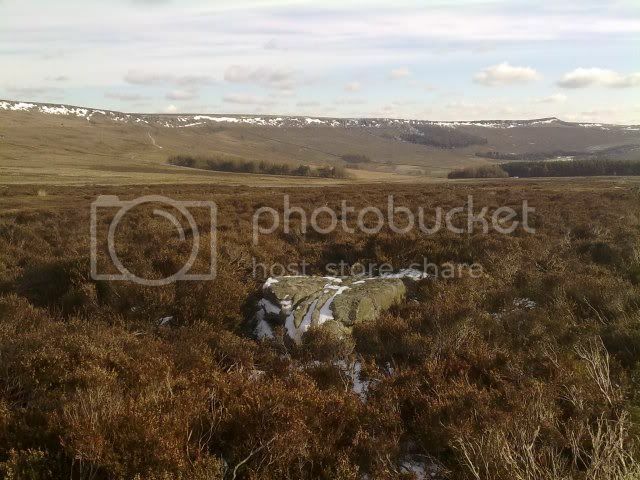 Quite difficult to locate on this barren and bog ridden moor the only close by feature to use for guidance is Bamford moor stone circle laying some 200 metres to the stones S/SE. Really worth the effort but take your wellies. !